“There is magic in the air.” Not a sentence one would expect to see in association with research and field science, is it? But the great thing about science is that it so often skates along the edge of understanding; and just past that edge are mysteries that sometimes seem like magic. It’s the pursuit of those mysteries, the demystifying of the magic, that drives so many scientists. I’ve been fortunate to work with a group of cetacean scientists for five years and have seen quite a few mysteries explained, but each explanation gives instant rise to at least one new question, and usually more. That’s one of the greatest frustrations, and the greatest pleasures, of working in a scientific field. And there’s another great pleasure as well: sharing knowledge with others. This one, I believe, is the true end goal of science. It’s not just about discovery; it’s about dissemination. Knowledge is nothing if it’s not communicated. The Marine Mammal Program’s annual Baja Expedition is about all these things: discovery, understanding, sharing. It’s a rare opportunity for people of all backgrounds to learn, answer questions and ask new ones. Our passengers can see elephant seal pups roll over each other and teach themselves to swim, watch juvenile California sea lions make a beeline toward a boat because they’re curious about us and touch a whale because that whale chooses to be touched. As a staff member of these expeditions, I find it just as much fun to watch others make these discoveries as it was to make them myself. One of the questions I’m often asked on this trip is, do I ever get jaded? Am I tired of it yet, seeing the same things each year? The quick answer is, no way. The longer answer takes the form of a short story. Our time in San Ignacio Lagoon includes a trip to a particular beach that I adore. 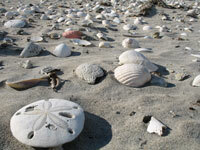 It’s located at the north entrance to the lagoon and is literally covered in places with shells and bones. Most of our passengers take great delight in beachcombing this area and quickly spread out as they wander in pursuit of that next interesting or beautiful thing. But I usually sit. Because if we can get to this beach at the right time of day, an amazing thing happens: the wind dies down, the lagoon calms and sound carries. So if I can find a quiet spot to just sit and listen, I can hear whales breathing. I hear them all over the lagoon. Some are close to me; others can be over a mile away — far enough that I see the blow a half second before I hear it. There’s only one word to describe what it’s like to sit in the sun, on a spectacular beach in a pristine environment, and listen to whales breathe. Magic.